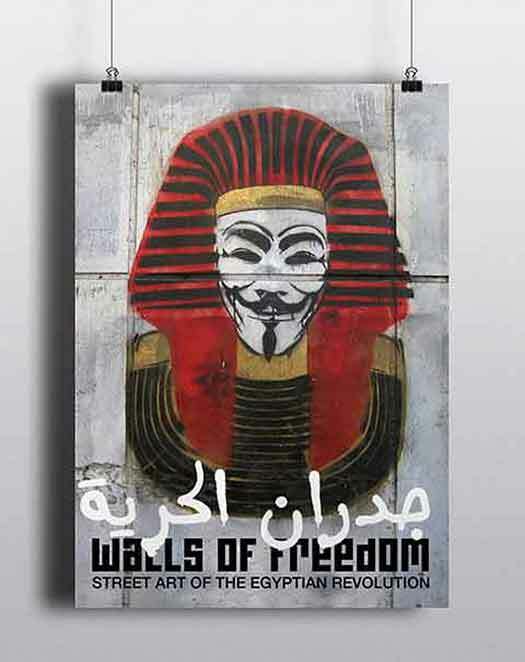 “Walls of Freedom: Street Art of the Egyptian Revolution” book release party is a collaboration between artist and writer Alan Ket and Revolution Books. Ganzeer, one of the artists featured in Walls of Freedom will be at the bookstore to sign books. Walls of Freedom tells the story of the art that appeared on Egypt’s walls over the past 3 years starting January 25, 2011. The Arab Spring saw an unparalleled explosion of graffiti and street art but few in the West know anything about it. Striking images transformed Egypt’s walls into a visual testimony of bravery and resistance to the ruling authorities — including Mubarek, the army, Morsi and the Islamic fundamentalists — tracing the journey from the early days of hope and inspiration to the decline into today’s nightmare. Spanning Cairo, Alexandria and Luxor, the book is a document of the volatile and fast-shifting political situation there. Walls of Freedom was created in collaboration with artists on the frontlines of the battle, and it documents how they converted the streets into a dynamic newspaper of the people which countered the brainwash in the mainstream media. It includes haunting photographs of key events captured by acclaimed photographers and activists.